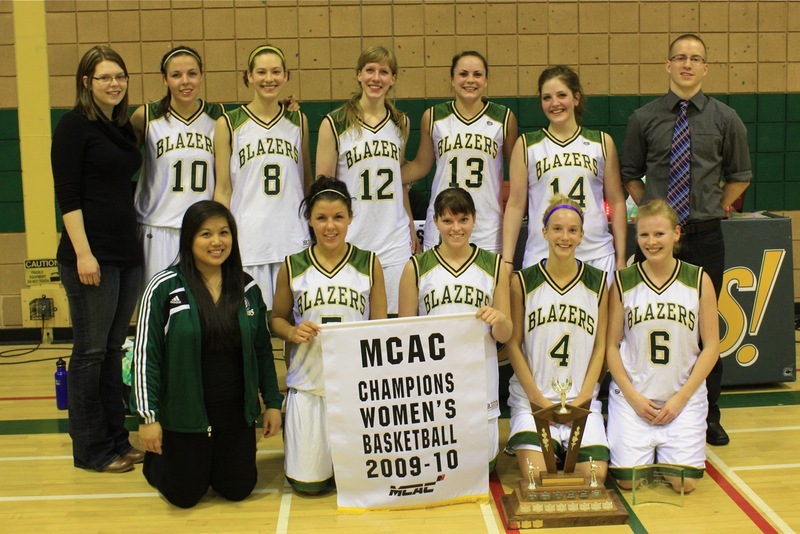 More than 300 spectators packed the Loewen Athletic Centre at Canadian Mennonite University on Saturday, March 6 to witness CMU defeat Red River College 70-26 to win the 2010 MCAC Women’s Basketball Championship. Despite the lopsided final score, the two teams were very evenly matched through the first half of play. In fact, the #2 ranked Rebels held the lead during the opening quarter, getting point production from teammates of the conference’s leading scorer Brittany Adrian. Adrian was held scoreless by the Blazers in the opening quarter and had her only field goal in the game in the second quarter, ending the game with a mere 4 points. The regular season’s Most Valuable Player Christie Anne McCullough, who would be selected Tournament MVP at the conclusion of the final, was also held in check by the Rebels in the opening quarter managing only a three-point field goal in the opening ten minutes. But the fifth-year point guard produced more than just points for the Blazers. CMU had just that on Saturday night. The Blazers ended the half with a 30-18 lead. An effective press in the second half allowed CMU to put the Rebels completely off their normally potent offensive game. A fantastic accomplishment in a conference championship final, CMU would get scoring from every player on the roster. McCullough, Tamara Andjelovic and Jaime Semchuk each collected 12 points to lead all scorers. Mallory Shack and all-conference selection Anneke Hildebrand each delivered 8 points in the win. The conference championship was sweet redemption for the returning Blazers, as CMU fell to Red River in the conference final a year ago on the Rebels’ home court. McCullough and freshman Hildebrand were both honored in the afternoon at the MCAC Basketball Awards banquet with selections to the all-conference team. Other selections included Red River’s Brittany Adrian and Karie Magpantay, and Providence College’s Sonia Radi and Jillian Reimer.